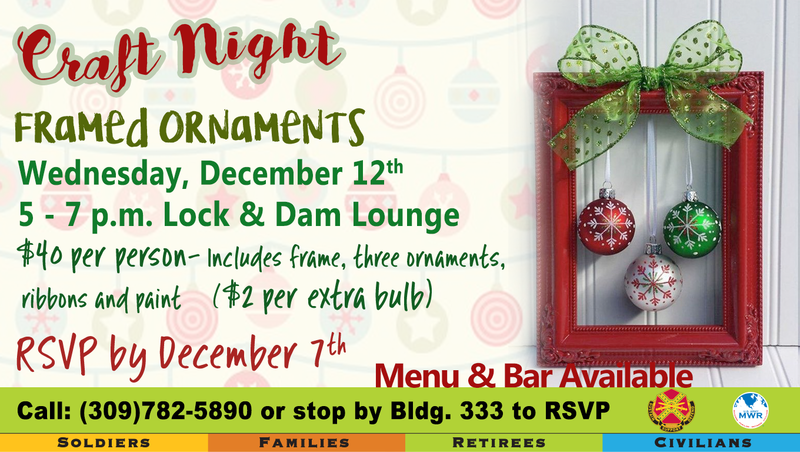 Date: Dec 12 2018, 5 p.m. - 7 p.m.
Join MWR at the Lock & Dam Lounge to learn how to make this fun & festive holiday decoration. Cost is $40/person and includes all the materials you'll need to make your very own framed ornaments decoration, extra bulbs can be purchased for $2 each. Food and beverage will also be available for purchase. Please RSVP by December 7th by calling +1 (309) 782-5890.